This is a beautiful and rare puzzle by Jumbo, depicting the work Winter Amusements, by Cornelis Kuipers. 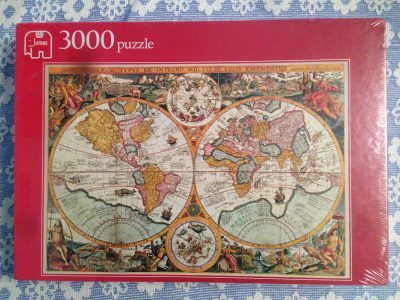 This puzzle is COMPLETE (3036 pieces). The pieces and the box are in excellent condition. There are several puzzles with this type of winter scenes, like the 3000 pieces version of Winter Landscape. Puzzle size: 85 x 122, 33.5″ x 48″. Other titles: IJspret; Plaisir de l’hiver; Eisvergnügen; Piacere dell’inverno.